Hojicha, roasted tea, attracts many people thanks to its nice fragrance. Did you happen to know there are roughly two types of hojicha? 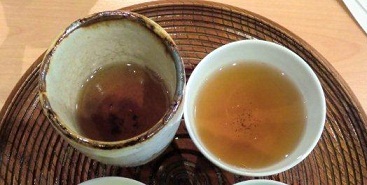 One is mainly made from tea leaves, the other is from stems (known as “kuki-hojicha”). Generally, kuki-hojicha has slightly darker color and richer taste, while the other has lighter taste, but more aroma. Why? Nutrients are taken in from roots, then come through stems, and finally reach to leaves. Therefore, the stems absorb more nutrients first before they are reached to the leaves. When they are not roasted, they are called "kuki-cha (steam tea)". Other than stem tea, there is "me-cha (buds tea)" produced from the buds too. Yes, even the stems and the buds, they can be a good tea! Very economical and eco-friendly, aren't they? ?